I found another paper that has some data on variability of programmers’ productivity, and again it shows that the differences between programmers isn’t as big as the “common wisdom” made me think. These numbers are the same order of magnitude as the Curtis numbers (which were 53% and 87% for the two tasks). Ko et al don’t break out the time spent per-person, but they do break out actions per person. (They counted actions by going through screen-video-captures, ugh, tedious!) While this won’t be an exact reflection of time, it presumably is related: I would be really surprised if 12 actions took longer than 208 actions. Looking at the action results closely, I was struck by the impossibility of ranking the programmers. Coder J (white) was the only one who finished the SCROLL task (and so the only one who finished all five), so you’d think that J was really hot stuff. However, if you look at J’s performance on other tasks, it was solid but not overwhelmingly fast. Coder A (orange) was really fast on YELLOW and UNDO, so maybe Coder A is hot stuff. However, Coder A spun his or her wheels badly on the LINE task and never finished. Coder G (yellow) got badly badly stuck on LINE as well, but did a very credible job on most of the other tasks, and it looks like he or she knew enough to not waste too much time on SCROLL. Coder B (light purple) spent a lot of actions on THICKNESS and YELLOW, and didn’t finish UNDO or SCROLL, but B got LINE, while A didn’t. The standard deviation of the number of actions taken divided by the average number of actions is 36%, 69%, 60%, and 25%, respectively. If you look at the number of actions each developer takes to do *all* tasks, however, then the standard deviation is only 21% of the average. 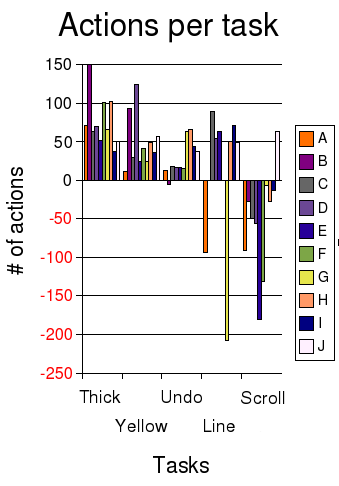 The most actions taken (“slowest”) divided by the least actions (“fastest”) is 37%, 20%, 26%, and 54% respectively. 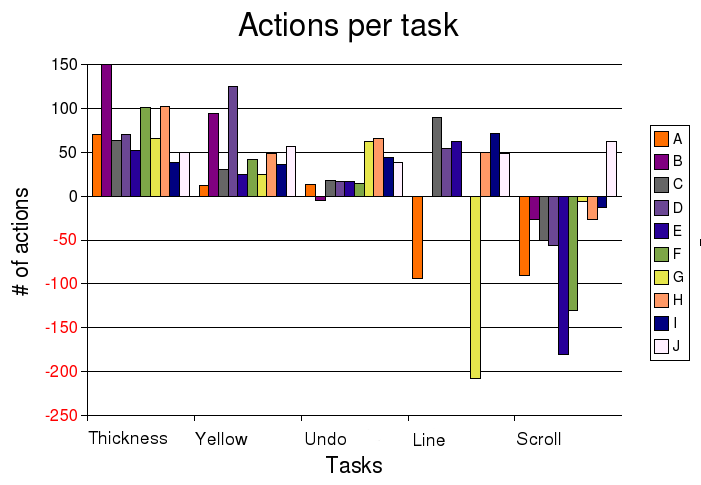 The overall “fastest” coder did 59% as many actions as the “slowest” overall coder. It also seemed like there was more of a difference between the median coder and the bottom than between the median and the top. This isn’t surprising: there are limits to how quickly you can solve a problem, but no limits to how slowly you can do something. What I take from this is that when making hiring decisions, it is not as important to get the top 1% of programmers as it is to avoid getting the bottom 50%. When managing people, it is really important to create a culture where people will give to and get help from each other to minimize the time that people are stuck. The table it seems wrong. The values you had taken belongs to table 3, page 975 of the paper. However, the average time for scroll was 17 minutes. 64.5 was the average of actions for that activity. Moreover, 70 minutes was given to each developer to do 5 tasks. So, having 64 minutes as average means they had only 6 minutes for the rest of the tasks which is contradictory according the rest of the table. The same happens with the standar deviation. +/- 13 minutes instead of +/- 55 minutes.